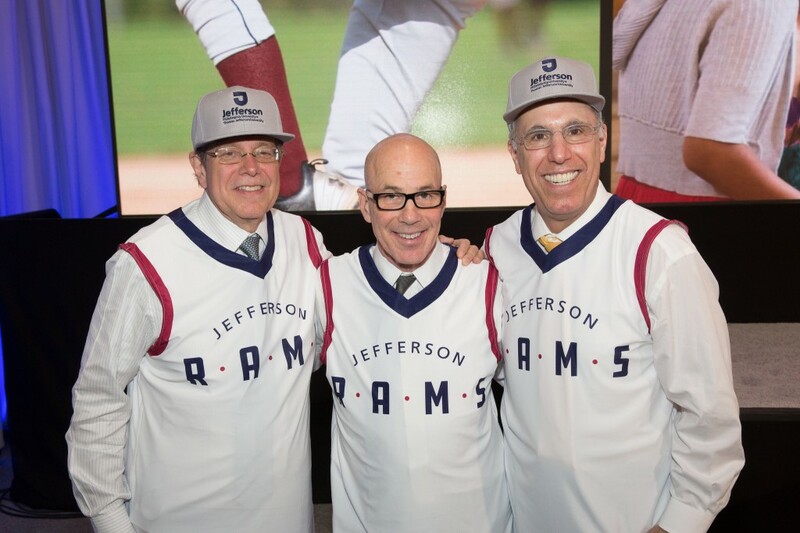 Mark Tykocinski, MD, Stephen K. Klasko, MD, MBA, and Stephen Spinelli Jr., PhD, debut the new Jefferson Rams uniform at the official combination ceremony. 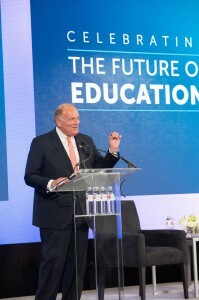 Philadelphia University and Thomas Jefferson University announced their official combination, effective July 1, 2017, creating a national comprehensive university designed to deliver high-impact education and value for students in medicine, science, architecture, design, fashion, textiles, health, business, engineering and more. The name for the combined institution, which will be the fifth largest in Philadelphia, is Thomas Jefferson University and will be referred to as Jefferson in common usage. The Honors Programs will be in the newly formed Philadelphia University Honors Institute. All existing academic programs and degrees from both universities will continue and many will be expanded. The formal announcement was made by university leaders June 29 in front of hundreds of faculty, staff, students, trustees, alumni and area dignitaries in the Gallagher, Athletic, Recreation and Convocation Center. Supported by design and systems thinking, innovation, entrepreneurship, empathy and the modes of thought central to the liberal arts and scientific inquiry, the new Jefferson creates a unique model focused on interprofessional and transdisciplinary approaches to learning, Spinelli said. It provides a vibrant and expandable platform for professional education and the ability to prepare students for current and yet-to-be-imagined 21st-century professions. In particular, the new Jefferson will build on Thomas Jefferson University’s and Philadelphia University’s proven approaches to aggressively add even more value for students through curricular innovations that include leading-edge programs in emerging professions; accelerated programs that enable students to earn undergraduate and graduate degrees in a shorter time; valuable opportunities for scientific and applied research; and a new model for experiential learning and internship opportunities with some of the country’s top employers. Former Pennsylvania Governor Ed Rendell reminisced about attending Herb Magee’s 1,000th win. Among the many highlights from the combination ceremony, Chuck Lewis, Jefferson enterprise executive vice president and chief growth and marketing officer, revealed the new visual identity that “celebrates our history and signals forward-facing change.” The symbol is a modern academic shield formed by blending the letters T, J and U and creating the letter P silhouetted in its counter space, which infuses the shared equities and vision. 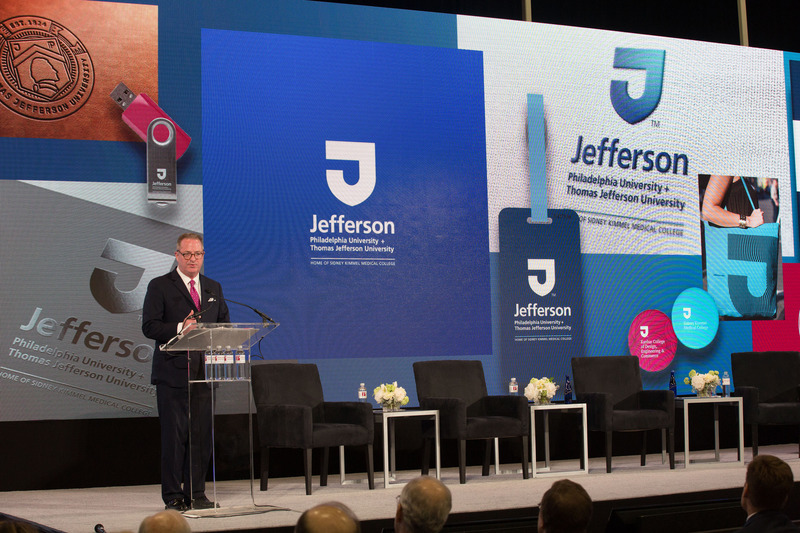 “It is a striking identity system that represents all of the students and disciplines that are now part of the new Jefferson—from medicine, health, population health and science to fashion, architecture, design, engineering, textiles, business and the liberal arts,” he said. Eileen Martinson ’86, chair of Philadelphia University’s board of trustees and co-chair of the Jefferson academic board, described the importance of the historic day. Naismith Memorial Basketball Hall of Famer and Head Men’s Basketball Coach Herb Magee shared that sentiment, telling the capacity crowd, “I’m thrilled this is happening. 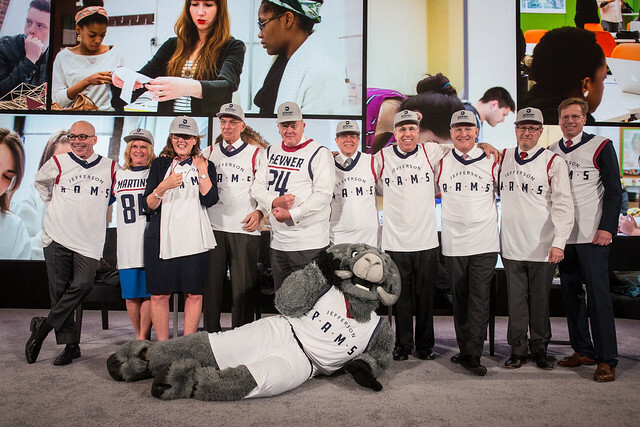 I can’t wait to start next year.” Philadelphia University’s mascot, Phil the Ram, will be the Jefferson mascot, and the 17 intercollegiate athletics teams will be known as the Jefferson Rams. Edward Rendell, former governor of the Commonwealth of Pennsylvania, current chair of the Jefferson Presidential Leadership Council, and East Falls resident for 36 years, recalled how he attended Magee’s 1,000th win and shared a favorite quote from President John F. Kennedy. In order to consummate the combination, notices were provided or consents obtained from approximately 30 accrediting agencies, including Middle States Commission of Higher Education, the Departments of Education of the United States of America and Commonwealth of Pennsylvania, the NCAA and the Central Atlantic Collegiate Conference. 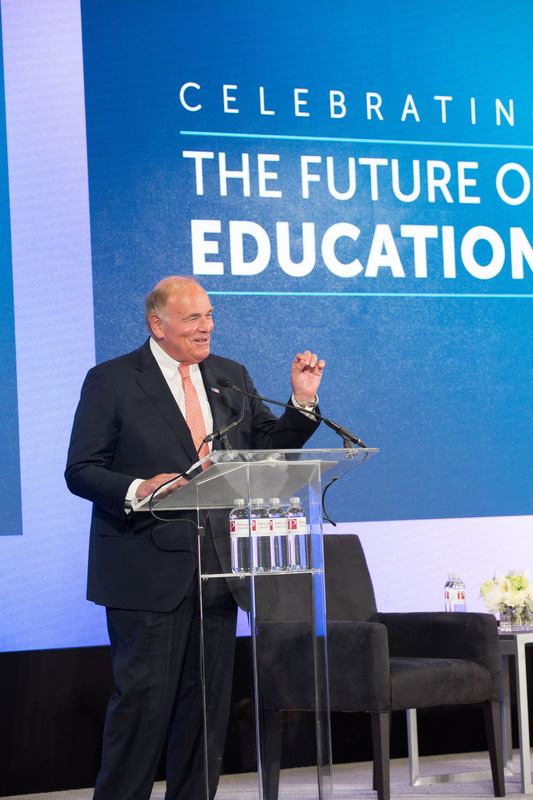 In addition to nine colleges and three schools from both universities, the formation of the Philadelphia University Honors Institute and the Philadelphia University Design Institute will be key components of the combined university’s educational ecosystem. 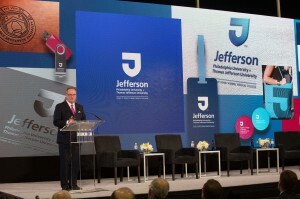 Jefferson will include campuses in Center City, East Falls, Montgomery County, Bucks County and Atlantic County; a growing online presence; numerous clinical sites; and an extensive global footprint with locations in Italy and Japan, study abroad sites and curricular and co-curricular partnerships and networks. Jefferson will be home to more than 7,800 students, 4,000 faculty members and 78,000 alumni. The synergies between Philadelphia University and Thomas Jefferson University also enhance the combined university’s ability to meaningfully expand research and discovery in the spheres of basic, translational, clinical, health policy and applied research. Research faculty already have begun collaborating to create joint grant applications to federal agencies, industry and foundations. “As of today, this is the no-limits university,” Klasko said. Read more about the combination here.